A Vogel Tormentil (Potentilla tormentilla) is a herbaceous perennial related to the rose family. It is found in the wild in many parts of the world, including Europe. The root of Tormentil is blood red in colour when cut and has been used in bitter liqueurs to aid digestion as well as in traditional healthcare to help maintain the normal function of the lower bowel. Tinctures of: fresh Potentilla tormentilla (Tormentil) root 75% and fresh Avena sativa* (Oats) aerial parts 25%. Alcohol content: approx 63% v/v. 20-30 drops 2 to 3 times daily, in a little water. 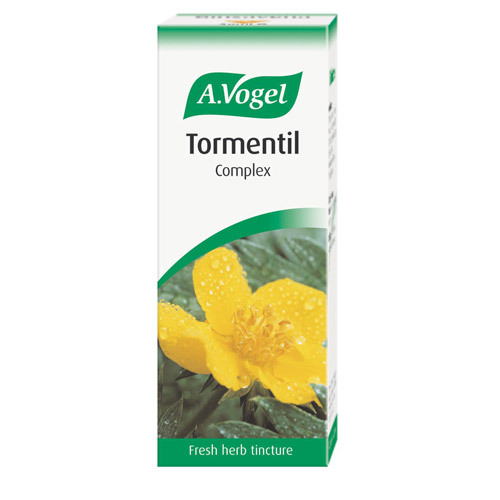 Below are reviews of A Vogel Tormentil Complex - 50ml by bodykind customers. If you have tried this product we'd love to hear what you think so please leave a review. This product is really great for helping my wife's irritable bowel. Thank you. A Vogel Tormentil Complex contains extracts from freshly harvested Tormentil root and oat herb (Avena sativa). It is one of Alfred Vogel’s original remedies. This helps to maintain healthy lower bowel function.